Phra Nang Phaya were created during of Ayuttaya era, Phitsanulok province. 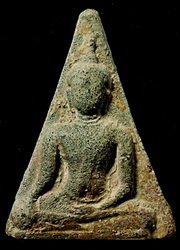 The major discovered are from Wat Nang Phaya around B.E.2444. The temple was said to be built for merits making to his Queen, the mother of King Naresuan, the Thai people given name "Queen of Thailand amulets". Phra Nang Phaya are very famous for bless strong with attractiveness and respectful from all others, also power on charm and safe from all dangers..
Phra Nangphaya amulets are respected as some of the most sacred amulets in Thai history. In B.E.2482, Luang Phor Tanom, the former Abbot of Wat Nangphaya, Pitsanulok province, was renovating the temple and as part of that process he moved an ancient but badly damaged chedi to fill in an old pond. Banana trees were then grown on the spot. Few years later, Thailand was amidst World War II, and many locals had sheltered at the temple, some using the banana trees. 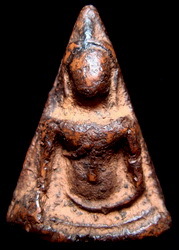 By chance Phra Nangphya amulets were discovered in the earth beneath the trees. The locals continued to dig and found more and more of the Phra Nangphaya amulets. It was at this time that the local population was desperately trying to find efficacious amulets to protect themselves from the dangers of war, so it was no surprise that hundreds of people were to turn up in search of the ancient amulets. It wasn't long before all the amulets had been removed from the site, with only the broken fragments remaining. Luang Phor Tanom collected all the fragments and ground them up into a sacred powder so that he could create some new amulets, now popularly known as Phra Nangphaya BE 2514. Luang Phor Tanom invited Thailand's most senior monks to attend the consecration ceremony so that he could ensure that they were as powerful as possible. All the monks that attended were highly respected by the Thai people for their magic power. Some of the most famous monks present included Luang Phor Ngeun of Wat Don-yai-hom, Luang Phor Toh of Wat Pradoochimplee, Luang Phor Fun Archaro of Wat Tumkham, Luang Phor Pang of Wat Udomkongkakirikett, Luang Phor Wan of Wat Doy-mapung, Kru Baprohmchaksangwora of Wat Prabuddhabattakpa, Luang Phor Toep of Wat Changpuek , Luang Phor Kasem Khemako of Triluksana Graveyard, Luang Phor Kom of Wat Pai-rongwua, Luang Phor Thira of Wat Pa-lae-lai, Luang Phor Ode of Wat Junsen, Luang Phor Pae of Wat Phikultong. Luang Phor Tanom had created Pranangphaya B.E.2514 amulets in two sizes, the big size (or Pim-yai), and the small size (Pim-lek). Both of these amulets we are pleased to say are now in stock. Essentially these amulets are recognized as probably the best NangPhaya amulets created in modern Thai history, and are highly recommended for any serious amulet collector, or indeed anyone who is interested to acquire a high quality sacred amulet at an affordable price. Luang Phor Tanom was highly respected as the father of Phra Nangphaya's legend because the original sacred Phra Nangphaya amulets were found while he was still the abbot of Wat Nangphaya. He also re-created this new series of Phra Nangphaya amulets with the sacred powder ground from the broken fragments of the original ancient amulets. 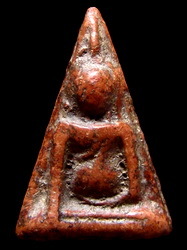 Phra Nangphaya B.E.2514 amulets are highly desirable and very popular amongst worshippers and amulet experts alike. It is generally accepted that the consecration of these amulets in BE 2514 represented one the greatest ceremonies ever held in living memory, and unlikely to ever occur again in the future.